← Christmas Comes Early with pCon.planner 7.4! Room plans are great for providing an overview of a space, but there will always be a challenge when it comes to limitations in imaginative power. Thanks to virtual reality, however, that’s a thing of the past. Fully furnished rooms can be experiences before they’re ever built, and what was only seen in the minds of architects and designers, can now be experienced live by customers. The best part: Virtual reality headsets “transport” customers into the plan, turning the spectator into the actor! Contrary to presentations, which may sometimes go in one ear and out the other, virtual reality requires initiative and the fully divided attention of the user. After all, if the user doesn’t take part, doesn’t look around or move, then nothing happens. This is unlikely, though, as once the headset is on, we guarantee the user won’t stay still for long! That brings us to our next point: a sale is more than just a sheer transaction. It’s a process that requires flair and perception. The right amount of entertainment, service and product presentation is always required and virtual reality enriches all of these areas. To start with, the innovative technology in and of itself is exciting. But even when this initial curiosity phase of “new reality” passes, curiosity to explore the room, the furniture and the products is quick to follow. Thanks to the virtual reality headset, abstract ideas become clearer, turning into seemingly tangible reality. The presentation comes to life and the showroom becomes a playground of modern adventures. And let’s face it, who doesn’t want to be an explorer? At Orgatec, our booth visitors had the chance to try out various types of virtual reality headsets. One was a stationary solution that, thanks to interaction opportunities, was exciting even after the first try. 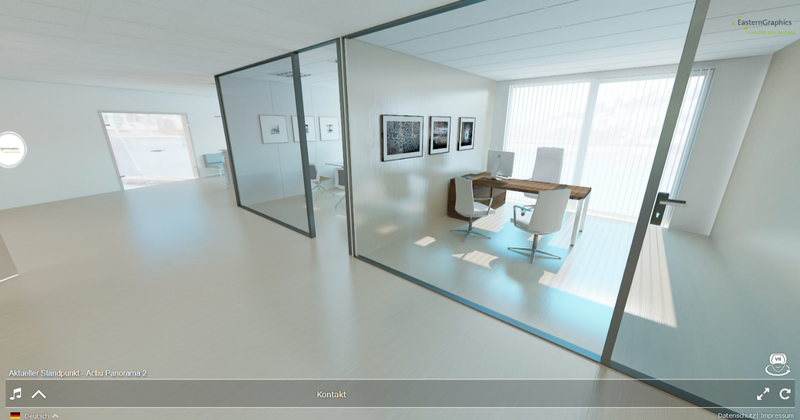 The other was a mobile version, in which the user could actually walk around a photo-realistically rendered room. The magic with this headset is that almost any kind of commercially-available smartphone can be used as a gateway to a virtual world. Want to learn more about the potential opportunities of pCon and virtual reality? Be sure to send us an e-mail or leave a comment below! 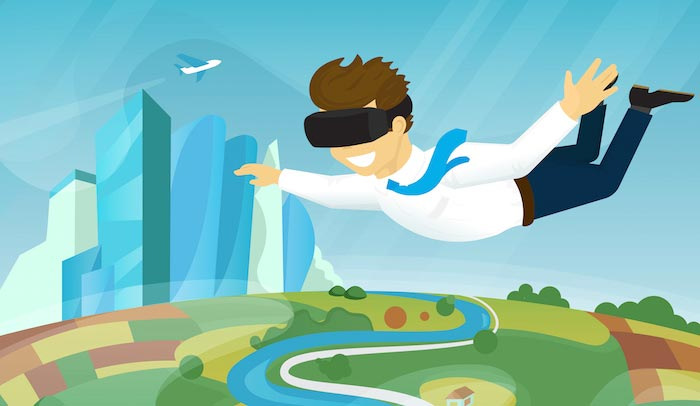 If you have a virtual reality headset for your smartphone, you can take a virtual tour through an Actiu plan and experience the magic of virtual reality for yourself! Start your phone, click on the image and click in the lower right to start VR-mode. Have fun! This entry was posted in Presenting, Sales and tagged Orgatec, Virtual Reality. Bookmark the permalink. How do I control the contents of my ‘Material Editor’ library ? It appears that every surface of every item that I import in to a drawing leaves it’s material details in the material editor. The amount of items can be quite large which slows down the process of finding items that I have created for the drawing ( floor coverings, wall coverings etc ) within the drop down list. Is there anyway I can create my own file of materials to speed things up ? 1) You can use the purge command in the material editor to get rid of unused materials. of finding materials in the material editor. quick access of those materials in any project. It is true that Virtual Reality had open gates and paved the gates of those branches, which were never imagined before. The gates which have been opened will create wonders for the world.